Councillor Ward was elected to Tameside Council in a by-election in July 2009 to represent Denton North East Ward. Councillor Ward is married to Councillor David McNally. They have four children – sons Sam and Thomas and daughters Nichola and Lisa. They also have four grandsons Henry, Matthew, Leo and Olly. Councillor Ward was born in Gorton and moved to Denton in 1979. Councillor Ward is a Member of the Greater Manchester Pension Fund and Speaker’s Panel (Planning). Councillor Ward is the Chair of the West Area Strategic Neighbourhood Forum, covering Denton, Droylsden and Audenshaw. Councillor Ward is a Governor at St.Thomas More RC College. Councillor Ward is President of Victoria Park Community Centre and Chair of Denton North East Homewatch and the Broomfields Residents Association. Councillor Ward was Deputy Mayor of Tameside in 2014-15. Councillor Ward is a hairdresser and has run her own business in Manchester City Centre since 1980. Councillor Ward hopes to work with as many community groups and schools as possible during her Mayoral year and is looking forward to meeting volunteers of all ages. Councillor Ward enjoys her work in the local community and also enjoys spending time with her family, holidays, reading, going to the gym and attending school reunions. 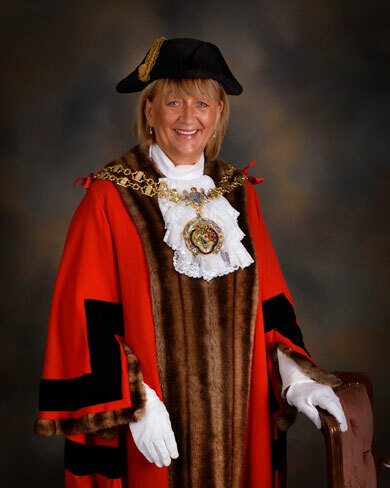 Councillor Ward will be supported during her year in office by her husband and Mayoral Consort, Councillor David McNally and by the Deputy Mayor, Councillor Leigh Drennan and his Consort, Mr Cory James.